"These are the first two full-resolution images of the Martian surface from the Navigation cameras on NASA's Curiosity rover, which are located on the rover's "head" or mast. 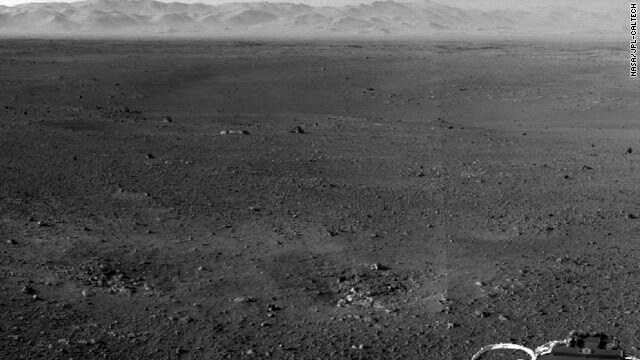 The rim of Gale Crater can be seen in the distance beyond the pebbly ground. The topography of the rim is very mountainous due to erosion. The ground seen in the middle shows low-relief scarps and plains. The foreground shows two distinct zones of excavation likely carved out by blasts from the rover's descent stage thrusters. These are full-resolution images, 1024 by 1024 pixels in size." when the next pics ll b released...?m eagerly waiting for those.. In black and white, it almost looks like part of Death Valley, or any other similar desert.